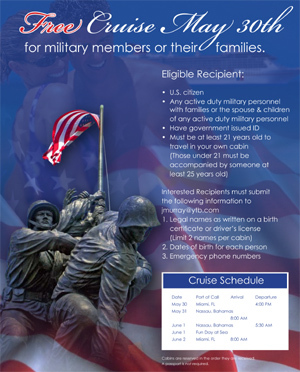 YTB is offering a free cruise from Florida to the Bahamas for U.S. military personnel and their families from May 30 to June 2, 2008. Please share this information right away with anyone you know either in the military or with friends or family in the military, especially if they're located in Florida. A travel company called YTB International is sponsoring a Bahamas cruise for U.S. military personnel and their families as the company’s way of saluting the men and women of the U.S. armed forces. The cruise departs from Miami, Florida on Friday, May 30, docks in Nassau, Bahamas the next day, and returns to Miami on June 2. Cabins on the cruise ship are reserved in the order in which reservations are received. A U.S. passport is not needed to participate in the YTB cruise for military personnel and their families. Our thanks to Pete Cordella of Blogging Vegas for this information. Pete is an affiliate of YTB, and can be reached at 702-506-0465. YTB International can be reached at 618-655-9477. YTB is a business networking opportunity that provides travel portals to everyday people. The service is like any travel agent service, only the people who sign-up for the travel booking website earn a portion of the travel agent commission. If it costs the same, why not book your travel through your friends and family instead of those large, heavily advertised online travel sites? That’s YTB’s philosophy. We haven't checked out YTB's program yet, as we wanted to make the information about this cruise available quickly because of the short lead time. But it sounds like a potential opportunity for additional income for military members or spouses who might be interested in creating their own online travel business. We are not recommending or endorsing YTB, and have done no research about the opportunity it offers. We are merely passing along the information, and accept no responsibility for your use of this information. We caution you to carefully research and check out the advisability of any business opportunity before getting involved or investing money.